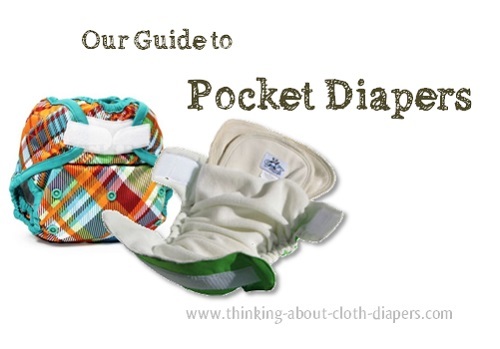 Pocket diapers are a two-part system, with a shell (pocket) and an insert that is tucked inside the pocket. Find out why they are such a popular and easy cloth diaper option for new parents. 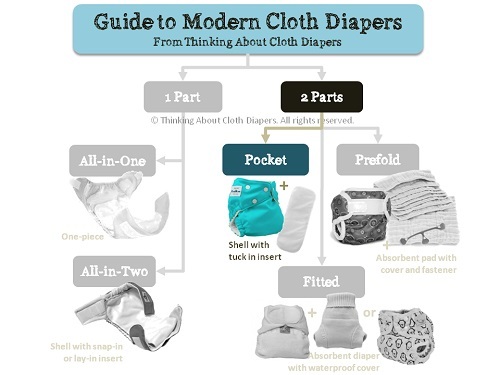 Of the various styles, pockets are one of the most popular cloth diapering options for new parents. Pocket diapers offer simplicity of use as well as customization of absorbency. Pockets are a two-part system, with a shell (pocket) and an insert that is tucked inside the pocket. They have a waterproof outer (usually made of PUL), and a stay-dry inside layer made of wicking materials such as microfleece, minky, or suede-cloth. The two layers are sewn together with an opening (usually at the back, but some put the opening at the front or have dual openings at both the front and the back) to allow parents to insert absorbent material into the pocket. Pocket diapers offer customized absorbency and quick drying times, and with wicking fabrics, they keep baby feeling dry even after they have wet the diaper. Wicking fabrics (microfleece and suedecloth) used in most pockets pull moisture away from baby, so they feel dry - perfect for babies who fuss at the least bit of wetness! How Much Absorbency Do You Want? To use a pocket diaper, you must "stuff" the insert into the pocket. Both the shell and the insert are laundered after every wear. Generally, you need to remove the insert before washing (except if the brand claims that the inserts will agitate out in the washing machine). Pockets are then "re-stuffed" before each use. While many pocket diapers come with inserts (usually microfiber), one of the main benefits of pockets is that you can customize the level of absorbency. This customization feature makes pocket diapers incredibly versatile! Experiment with types of inserts, or add extras for night-time use.You can use anything as an insert (including prefolds, or even towels if you run out of inserts!) If you're looking for more information on absorbency options, our cloth diaper inserts article is a must-read! Tip: Keep in mind when comparing brands and prices - some come with an insert (usually microfiber) while for others you must purchase separately! Once they have been stuffed, pocket diapers are as easy to use as all-in-one diapers. These diapers are a good cloth diaper at daycares and for daddies, since once they are assembled, they can be put on quite similarly to disposables. Because of the two-part system, pocket diapers dry much more quickly than all-in-ones, but all-in-ones are more convenient because they do not need to be stuffed. Most pocket diapers range in price from $10 to $25 including inserts, making them more expensive than prefolds and covers, and comparable to all-in-ones. Because some pockets include inserts and some do not, don't forget to consider this when shopping! This article discusses our favorite pockets. While less expensive pocket diapers are available, none except for the Kawaii Snazzy Minky are in our favorites. If price is your main consideration, don't forget to read our comparison of 6 popular cheap pocket diapers here. Pockets are one of the most common cloth diaper styles on the market. We've tried a lot of pocket diapers, and below is a list (in no particular order) of some of our favorites! Inserts must be purchased separately and can be used with both sizes, which saves money. Bamboo, overnight bamboo, and fleece-topped microfiber are available. Feel Good About It! The Little Bee Company's mission is to provide high quality diapers while helping build awareness for orphanages around the world. For every diaper you purchase from them, they will donate another one just like it to an orphanage in Africa, Asia, or South America. Through their "Diaper Drops", they are helping improve sanitation for children and their care providers. Not many manufacturers still make sized pocket diapers, but FuzziBunz was one of the first on the market and still offers a sized version with 4 sizes: X-Small - 4 to 12 lbs, Small - 7-18 lbs, Medium - 15 to 30 lbs, Large 25 to 40+ lbs. Snap down rise with 3 rows of snaps to provide small/medium/large settings to last from 7 to 35 lbs. Generously sized! While technically a one-size, I didn't get a great fit with these until about 10 lbs. They are wide throughout, making stuffing much easier for bigger hands. These diapers fit on the smaller end. The manufacturer suggests a weight range from 6 to 35 lbs, but it is visibly smaller than lots of the other one-size options available and has a short rise, and I've found that they do not fit toddlers very well. Great at containing newborn messes! These diapers have a dual inner gusset and a "poop scoop" at the back that help keep messy blowouts where they belong - inside the diaper! 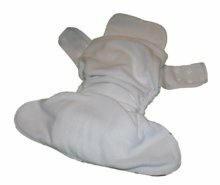 Comes with Rumparooz's 6•r (2 part) microfiber insert, which includes a one-size insert, plus a contoured newborn insert. The 2 inserts snap together with adjustable positioning. Hemp ($10) and bamboo ($12) insert sets are also available. SoftBums are one of my all-time favorite brands because they are one of the only one-size brands I've tried that truly fit both a newborn and a 35 lb toddler. Wide back pocket opening, also has a snap to allow insert to be laid on top as an AI2 as well. Funky Fluff's bamboo diaper is another of my favorites! While it was bulky initially, I did get a good fit with this one on my newborn from 8 lbs, and it fit my 40 lb toddler too! Natural fiber against the bum! Inner is rayon from bamboo terrycloth, perfect for little ones that might have sensitivities to suedecloth or those looking for a natural fiber option. Note: Bamboo is not a "stay-dry" fabric, but it is breathable and thermal regulating, meaning that it keeps your baby comfortable and cool when wet, and it dries quickly! Funky Fluff also makes a stay-dry suede cloth pocket diaper with suede cloth topped microfiber inserts, but I found it didn't fit at birth as well as the bamboo diaper did. 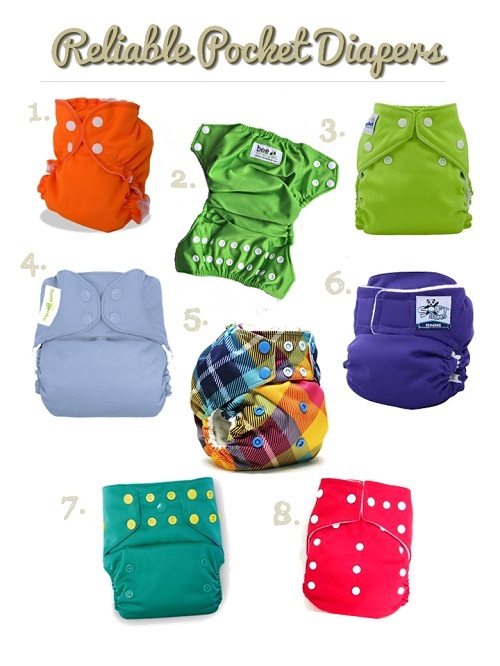 Pocket diapers remain one of the most popular choices for new parents because of their simplicity and customization. 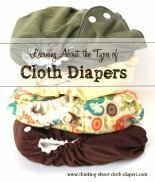 Learn more about other types of cloth diapers by continuing on to All-in-Two Cloth Diapers. To access the other articles in our series on types of cloth diapers, go back to Types of Cloth Baby Diapers. Want to buy locally-made cloth diapers? We've compiled a list of brands that are made in Canada or made in the USA to help you.